About to put away your rig for the winter, but not sure how to winterize an RV? Don’t fret, just review these steps from our service team. You can do all or some of your RV maintenance yourself or hand the work over to a professional. But either way, if you spend some time now prepping your rig for the cold months in storage, you’ll be glad you did come spring. 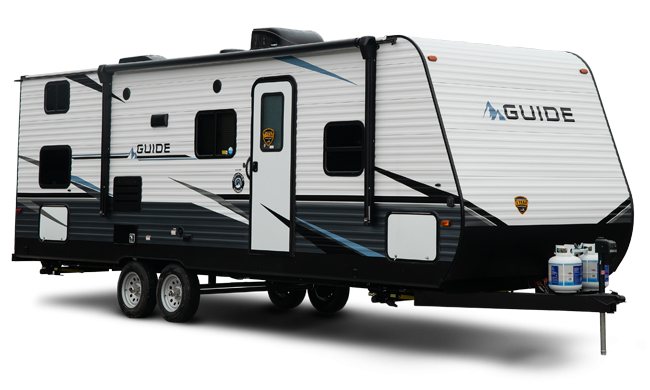 Note: This is general RV winterizing advice that applies to most travel trailers or 5th-wheels. Before you get started, review your owner’s manual for any unit-specific guidelines. Some RVs come equipped with built-in winterizing controls, too. One of the biggest concerns for an RV in winter is the water lines. Water can freeze, damaging lines and, when they thaw, make a mess that causes even more damage. To prevent water damage, take the following steps. A water pump converter kit, or tubing to connect to the inlet side of the water pump. Basic hand tools to remove drain plugs. Remove and bypass inline water filters before starting. Drain the fresh water holding tank. Drain and flush the gray and black holding tanks. Remove the drain plug to empty the water heater. Note: never drain the water heater when it is hot or under pressure. Open all hot and cold faucets including the toilet valve and any outside showers. Locate and open the low point drain lines. There will be one for the hot and cold water lines. Recap all drains and close all faucets. Bypass the water heater. If you do not the bypass valve, the water heater will fill up with antifreeze before it goes through the water lines, wasting the antifreeze. Install a water pump converter kit or disconnect the inlet side of the water pump (the line coming from the fresh water holding tank). Connect a piece of clear tubing to the inlet side of the pump and put the other end into a one-gallon container of non-toxic RV antifreeze. Turn the water pump on and pressurize the system. Starting with the closest faucet, slowly open the hot and then cold valves until antifreeze appears. Replace the antifreeze container as required. Repeat this process on all faucets from the closest to the farthest away. Don’t forget the outside shower, if equipped. Flush the toilet until antifreeze appears. Turn the water pump off and open a faucet to release the pressure. Go outside to the city water inlet. Remove the small screen over the inlet and push in on the valve with a small screwdriver until you see antifreeze. Replace the screen. Pour a cupful of antifreeze down each drain. Pour a couple of cups in the toilet and flush into the holding tank. If your water heater has an electric heating element, make sure it is turned off. This will protect the element if the unit is plugged in while being stored. Make sure all the faucets are closed. If you have an ice maker, washing machine, dishwasher, or other built-in water-using appliances in your unit, consult your owner’s manual for winterizing procedures. 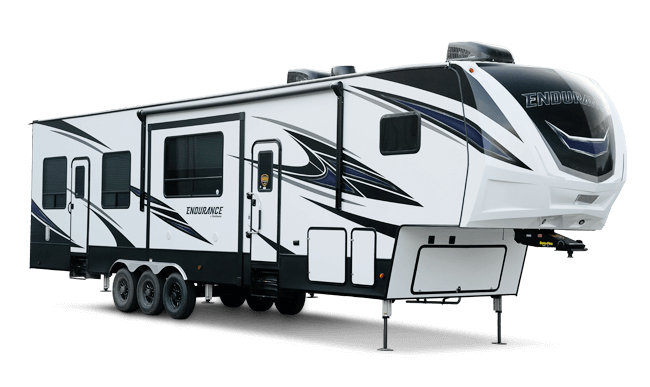 Draining the plumbing system is the most important task for winterizing your RV. However, there are other parts of your rig that need protection against the elements and the toll of being in storage. Follow these tips for how to winterize a fifth-wheel travel trailer to make sure yours is safe and that there are no unpleasant surprises come spring. Quick tip: For an easier time at the end of the year and at the beginning of camping season, we suggest making a photocopy of your unit’s checklist, then laminating it and keeping it stored in a handy (and easy to remember) place. That way, it’s always at the ready when you need it. 1. Tires. With thousands of pounds of weight bearing down on your tires as they sit all winter, they can develop flat spots. There are a few ways you can prevent this. If your RV has leveling jacks (not stabilizing jacks), follow the manufacturer’s instructions on how to raise your rig off the ground for extended periods. Alternatively, you can use outside jacks to do the same thing. 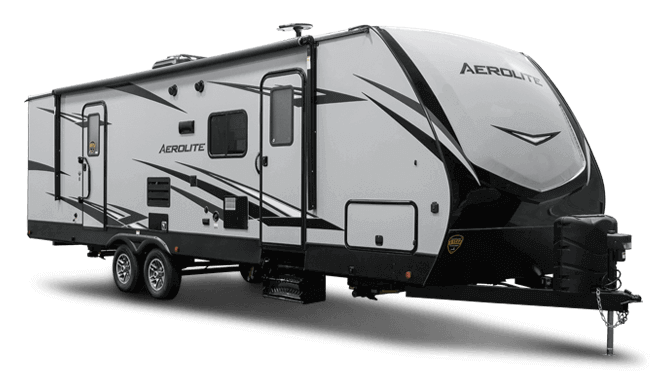 If neither is an option, you should move your RV about one-half tire revolution one or two times during the winter to redistribute the weight. To keep the tires from sinking into the ground due to winter thaw, park your rig on a paved or concrete surface. 2. Stabilizers. Lower your stabilizing jacks to keep your 5th-wheel steady while you’re walking around inside (it shouldn’t rock). Wooden blocks placed beneath the jacks’ feet will prevent them from freezing to the storage pad. For extra protection, coat the pivot points with silicone or graphite spray to prevent rust. 3. Batteries. Fully charge the batteries and top off fluid levels in maintenance-style batteries. If you live in a freezing climate, it’s best to remove all batteries and store in a dry, warm location. Otherwise, disconnect the cables for safety. 4. Electrical. Turn off the RV’s main circuit breaker and disconnect from shore power. Remove batteries from clocks, radios, and so on. Store the onboard or portable generator according to manufacturer’s directions. Block the exhaust pipe with steel wool or aluminum foil to keep out pests and make a note to remove it when you start up the RV again in the spring. 5. Interior. Clean out cabinets, removing food and toiletries. Even packaged foods should be removed, as they can attract pests. Cans and bottles can freeze and burst. Clean the stove and oven to remove traces of food that can attract pests. Clean the refrigerator and thaw and thoroughly dry the freezer. Leave the doors open with a box of baking soda inside to prevent mold and smells from accumulating. Remove clothing, bedding, and linens for laundering as well as any valuables like TVs and tools. 6. Exterior. Check the roof and body for any gaps or openings that could be an entry for insects and pests, as well as rain and snow. Caulk or repair as needed. While you have the caulk out, check the door and window seals and seal those, too, if there are gaps or cracks. Cover any exterior holes with screening and vents with cardboard or aluminum foil. Close the roof vents and cover air conditioners. 7. Clean and protect. Wash and wax your rig, make any replacements, and clean and store your sewer hose. Extend and clean the awnings with a cleaner designed for awnings; let it dry completely and stow or cover with rigid slip-on covers. Protect your RV from the sun and winter elements by parking it in a shelter or under a fabric cover made for RVs. And that’s how to winterize your RV in a nutshell! With these jobs done, you’re ready to enjoy your winter planning future trips with peace of mind that your RV will be ready to go when the mild weather returns. Share your RV winterization tips with us and other RVers on the Dutchmen Facebook page, where you’ll also find the latest RV news. And follow our Instagram account, @dutchmenrvcompany, for updates about our family of Dutchmen RV owners.